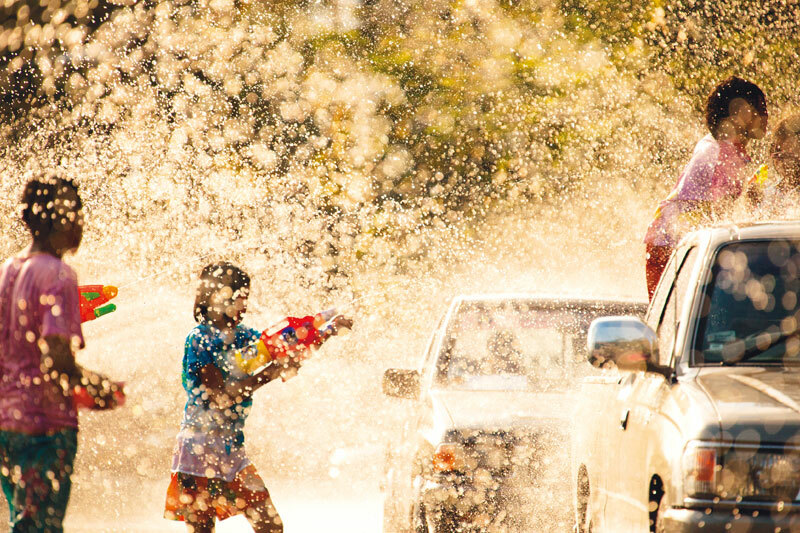 Thailand’s hottest time of the year marks Songkran, the traditional New Year. The festival is celebrated across the country as Thai people count on a new beginning, spiritual cleansing and, well-getting others completely soaking wet without guilt. The word “Songkran” itself, as legend has it, comes from Sanskrit, meaning transformation or the changing of the zodiac sign. The festival always falls on April 13th through the 15th, coinciding with the rising of Aries in the Zodiac chart. Songkran has been celebrated since the Sukhothai kingdom (1238-1438), and carried on throughout 400 years of the Ayutthaya kingdom (1351-1767), right up to the Rattanakosin era or present day Thailand. The first day of Songkran, April 13, is called “Wan Maha Songkran,” when the sun is about to leave Pisces into Aries. Usually, people clean up their homes and prepare for the new year merit-making. 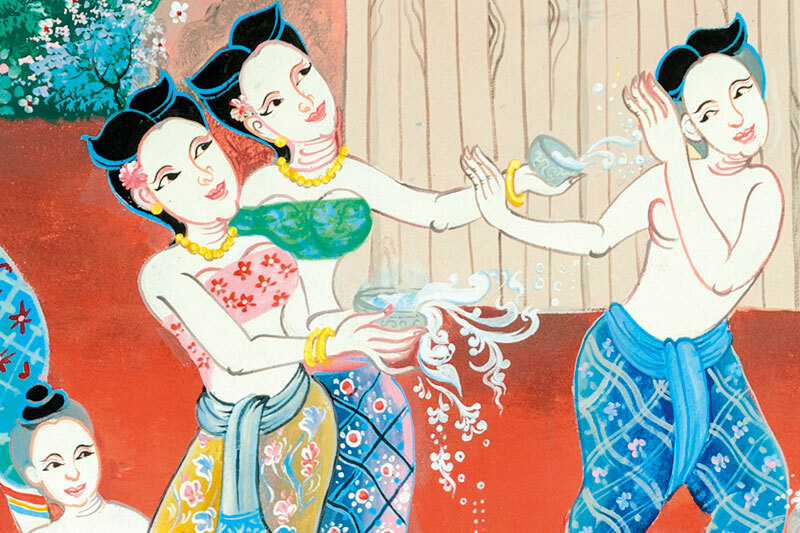 On the second day of Songkran, or “Wan Nao,” the sun approaches Aries – and completely leaves Pisces behind. Since it’s neither in the old or new year, but somewhere in between, people use polite words and hope for the best in the year to come. Many people go to the temple, with food and buckets of sand for the religious ceremony. The New Year begins on the third day “Wan Tha Rerk Suk,” since the sun has completely moved into Aries. Traditionally, the Buddhist temple would become the centre stage for the Songkran celebration. The classic Thai poem “Khun Chang Khun Phaen” portrays a love triangle during the Ayutthaya period, when the Songkran festival saw celebration for three days at a local temple. Local folks would gather at the Wat Pa Lelai monastery, as the poem goes, to offer food to the monks. People build sand pagodas as a way of making merit, along with freeing birds from cages. It is here, at the temple during the Songkran ceremony, that the dashing but poor novice monk Phaen meets beautiful Wanthong. Enter another suitor, Chang (unattractive but rich) who gets involved. They pour perfumed water into the hands of the elders to show respect and seek their New Year blessing. Then, young people throw buckets of water to each other for fun and to keep cool in the April heat. As time went by, Songkran began to be a more visible and active event. In Chiang Mai in 1922, the city promoted Songkran to boost domestic tourism. From Bangkok, visitors took an overnight train to Chiang Mai for the holiday. The very first tourist group to Chiang Mai visited the city’s landmarks, such as War Phrathat Doi Suthep before bathing the Singh Buddha image and throwing water amongst the locals. By the 1950s the city, led by its elite members such as Kraisri Nimmandheminda, reinvented Songkran Festival for tourism. In order to showcase Lanna culture and capture the festive mood of Songkran, Chiang Mai developed a procession of Buddha images and cultural floats. As the procession roamed around the old city of Chiang Mai, local people put up altars in front of their homes as a way to pay their respects to the Buddha. The addition of the beauty contest “Miss Songkran” added more colour to the festival, so did a series of Lanna cultural shows. By the 1980s, Chiang Mai attracted the first foreign tourists for the Songkran holiday following the successful domestic tourism campaigns. 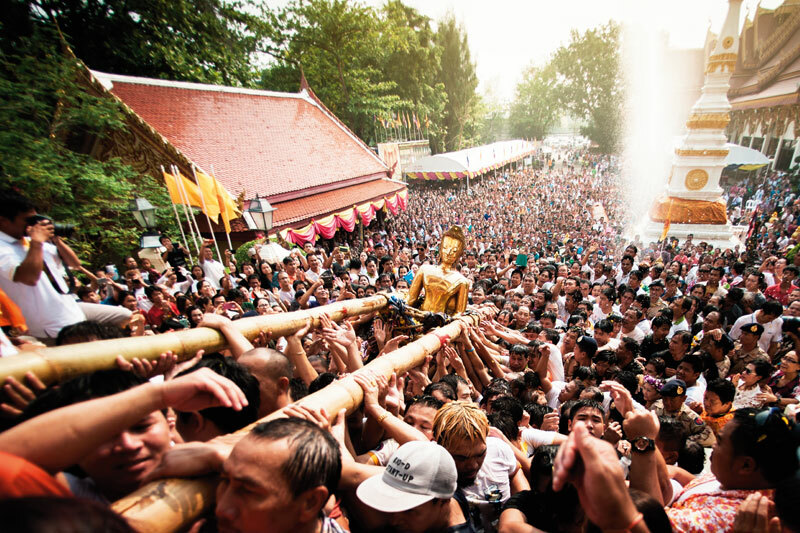 Phra Singh, Chiang Mai’s most sacred Buddha image, left the temple for the first time to join the Songkran procession. Many more temples created their own floats and joined grander processions. A parade of beautiful women riding bicycles and holding parasols became “poster girls.” The Tourism Authority of Thailand (TAT) joined in organising splendid cultural shows at Tha Phae Gate.